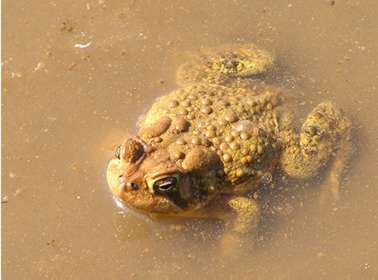 American Toads were out in force on Monday, April 19 at Huntley Meadows. This is the mating season for the toads and tadpoles should be hatching shortly. They were seen between points 9 and 10 on the walk map. Click on the above picture to see the toads in action using the Apple QuickTime Viewer. If you don't have the Apple QuickTime Viewer you may download a free version by clicking on the link below. Please note that the QuickTime program will take considerable time to download unless you are using DSL, a cable modem or other high speed internet access. After installing QuickTime come back to this page to view the movie. Click on Next to view the walk map.